While there is huge interest in the upcoming Fittest Superstars event in April the community and surrounding areas are really embracing the new health and fitness culture that is around the place with the Operation Transformation walks on Thursday nights and the Togging Out men's group which meet Tuesday, Thursday and Saturdays for exercise and fun. However the most excited bunch at the moment are the youth of the area, some cynics call them the playstation generation but to us they are the Fitbit generation! These are the boys and girls who have been influenced by Ireland's Fittest Family and are dragging their parents outside to count their time on a hang tough challenge on their swing or to helping them design an obstacle course around their home. 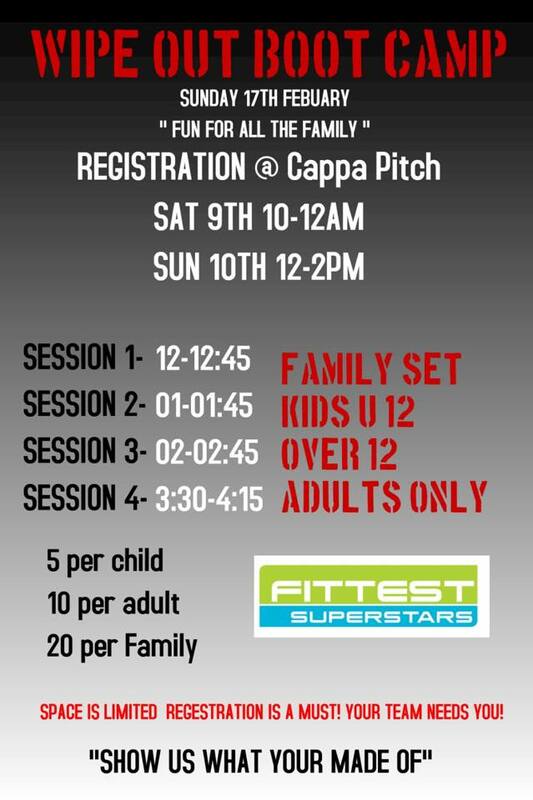 This has prompted Martin Conlon who has famously put the Bridge Bucks U6s and U8s through End of Season Boot Camps to organise something bigger and better this coming February - Introducing Wipe Out Boot Camp an event for all the family. We hope to see families of all ages coming together to take on the obstacle course with options for individual entries also available on the day. So Moms & Dads get the excuses out of the way now because they wont be tolerated when Colonel Conlon gets a hold of ye! There is no limit to the number of members on a family team so bring along the whole neighbourhood!